In celebration of Election Day in the U.S., let’s change course and pay homage to my favorite Franco-American gift, the gigantesque statue of Lady Liberty in the New York Harbor. Sadly, because of Hurricane Sandy, the Statue of Liberty temporarily closed again only one day after re-opening from being closed for a year-long supreme make-over. (Whew. Got that?) Don’t fret. A gal’s gotta do, what a gal’s gotta do. Soon she’ll be back in action. Yes, I’m a believer. Here’s to a speedy recovery! Our 151-foot tall iconic darling is still looking ever-so-fierce in her spiky nimbus (that’s right, it’s not a crown!) and her matching floor length chiton in all its coppery green tonalities. An exquisite nod to the style of classical Greece, I must say. Frédéric-Auguste Bartholdi was the artist, and Alexandre Gustave Eiffel and Eugène-Emmanuel Viollet-le-Duc were the structural engineers of the Union Franco-Americaine Statue of Liberty project. Yes, it is a small world. During the summer of 1885, it took Lady Liberty (300 copper pieces packed in 214 crates) one month and change to make the rocky voyage aboard the French ship Isere from France to the New York Harbor. 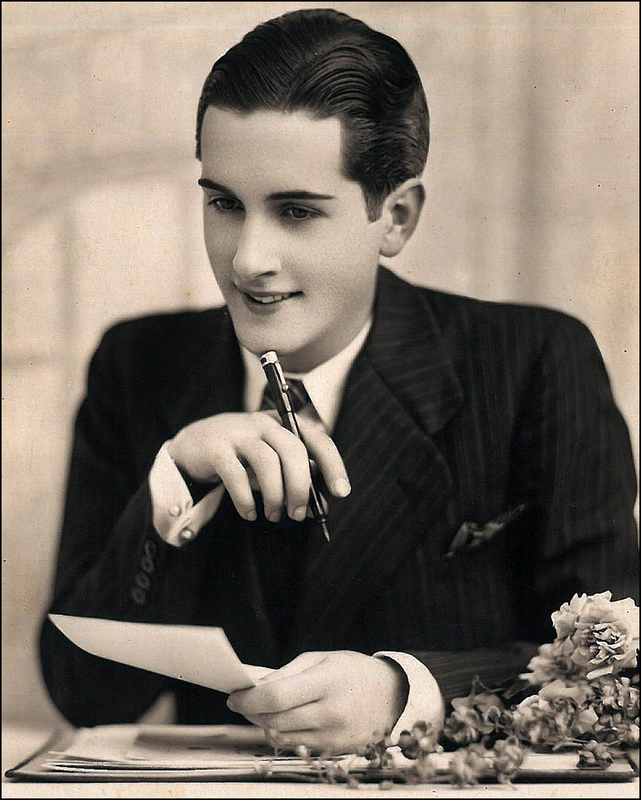 “You look marvelous,” Mayor William Russell Grace shouted, live from New York! 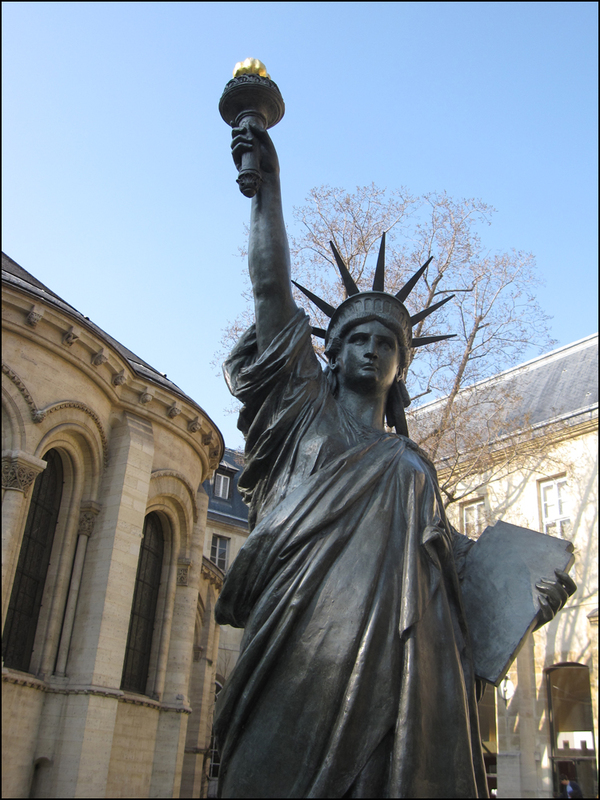 Don’t leave Paris without checking out the prototypes of Bartholdi’s La Statue de la Liberté scattered around the city. You can find them in a range of sizes near the Pont de Grenelle on the Île des Cygnes (Métro: Bir-Hakeim), in the Jardin du Luxembourg (Métro: Odéon), and at the Musée des Arts et Métiers (Métro: Arts et Métiers). Tip: And you can also find a full-sized version of the torch at the entrance to the Pont de l’Alma tunnel. Nowadays, it serves double duty as the unofficial Princess Di memorial. By the way, Bartholdi’s former studio is located at rue de Chazelles in the 17th arrondissement (Métro: Courcelles). Look for the plaque! Merci baucoup, Mlle B., pour une belle histoire de la Statue de Liberte’! Love the Dior quote…and all the images are wonderful, especially Coty “Tricolore” and the compacts! Swell, thank you!! 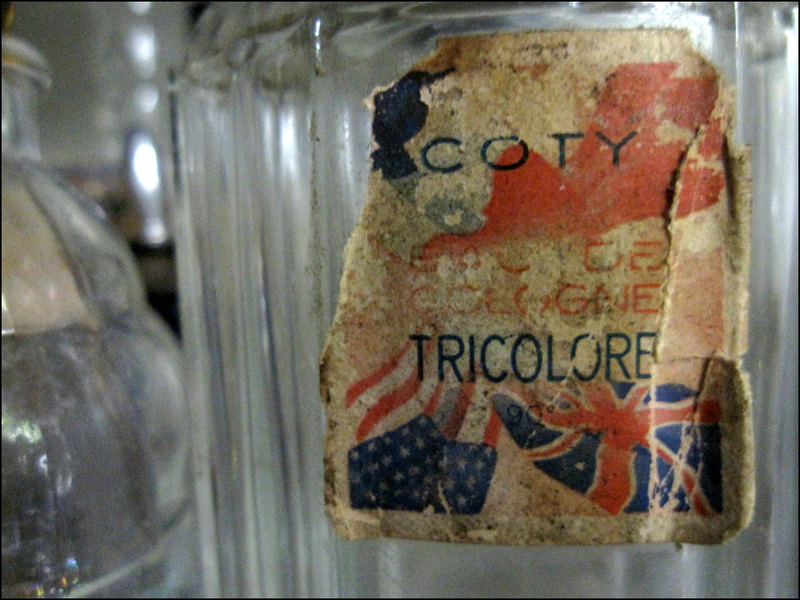 Coty’s “Tricolore” is one of my favorites. 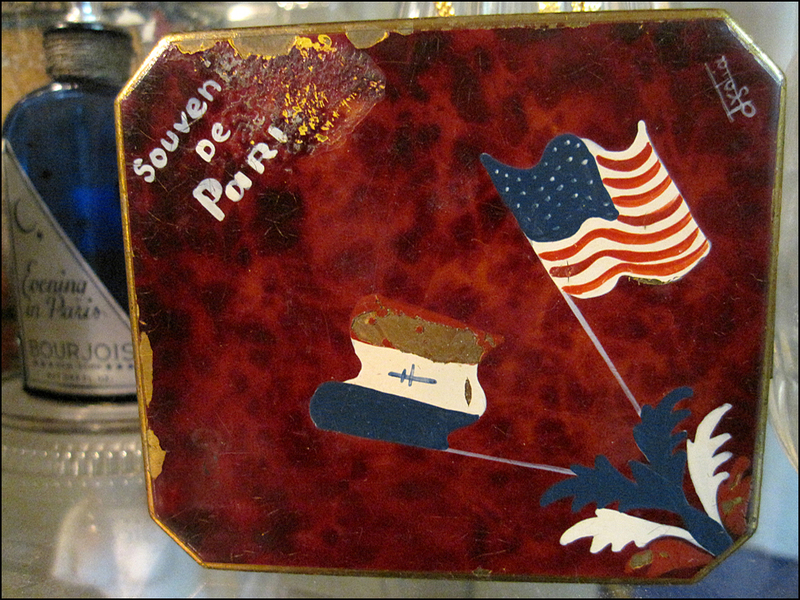 I fell for it the moment I spotted it at the Porte de Vanves Flea. It looks well-loved. I’ve been trying to track its exact release date. I’ll throw on my “Nancy Drew” thinking cap again! B.
I should know it, but vaguely remember…it’s been so long. Actually, my Mother preferred Estee Lauder; loved the aroma emanating from her dresser drawers, and sometimes smell it still. P.S. : Loved, loved Nancy and all her detecting (my Dad was a police detective!)!!! Hold the presses! I think our “Eau de Cologne Tricolore” was created in 1937 as a nod to the Coronation of George VI. The limited line was also called “Les Trois Couleurs.” The Royal mystery continues. . . I adore the photo from your archive, a very glamorous Lady Liberty at the wheel! The Parisian L.L’s look so at home! Love this blog…glad you are blogging again…missed you! I’m still here! Thanks for your sweet, sweet words!! T.
Merci, Theadora! (Great name, by the way!) I thoroughly enjoy the research phase. I get obsessed. It’s always difficult for me hit the “publish” button and take a post “live.” It’s all about the process, eh? Enjoy the week! T.
Stunning. Stunning. Thank you for sharing Franck Rheinboldt’s gorgeous shot of the Statue of Liberty. It’s a stunner!! 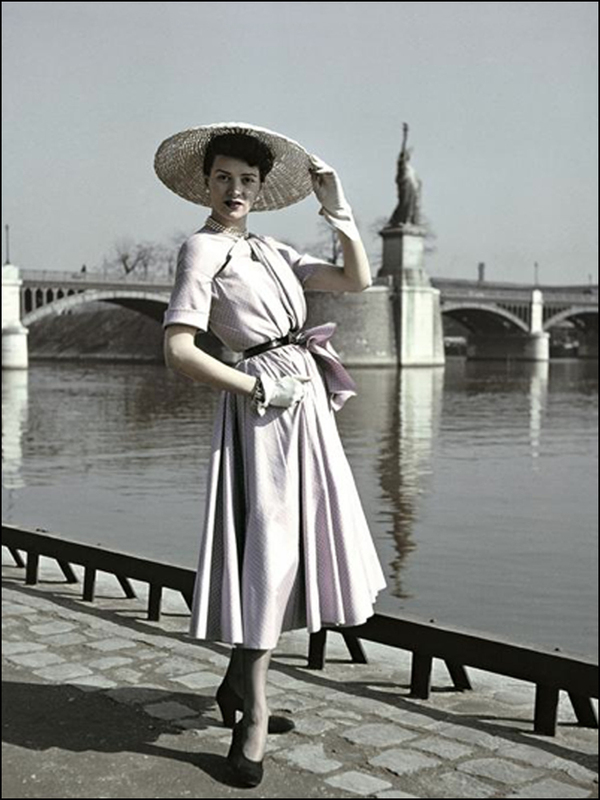 T.
Delightful glimpses of Paris and fashion of the ’40s and ’50s. I am spying your antique perfume bottles now! An enjoyable post Theoadora. Thank you! My bottles. My babies. I’m currently cooking up an “Evening in Paris” post. Created by Bourjois in 1929, the cobalt blue bottles are beauties. Interesting history, to boot! T.
I bet you have a big family T! Looking forward to seeing the blue glass. (I photographed an undramatic dolphin or 2 last week for you. Might do a special post if they cooperate over summer)! I love your fantabulous postings. I’ll keep my eyes peeled for it! T. Merci!! Do you have a favorite prototype? It would make a great scavenger hunt! T.
She is indeed a well-travelled dame for her time, and copper is the finest of robes (copper is my trade)…I must admit she admonishes a little with the way she haughtily stares, but which man does not need to be challenged? Still, her ethics are a bit too good for me, and one likes a little bawdiness and naughtiness every now and then…just a touch…so I won’t be trying to woo her…I’m all for justice and hope, but the fatal passion of an iconic monument like the Taj Mahal has a certain allure..a beautiful gift by Paris though, in the eyes they saw her future hosts. Copper beautiful! I’m genuinely happy you enjoyed the mine – now, was thinking the same thing about the statue. My opinions about where the copper came – at that time 2 European countries were world leaders in copper mining and smelting – Sweden and Wales. Poland also had well-established copper mines in the south of the country. It may also have come from Africa, in the Congo. I will try hard to find out! Well…that’s fun about the cinnabar copper rings – are there many in Paris? It is interesting, I must say. Norway…would never have guessed! Would have thought Poland, or Bulgaria first, due to historical alliances. The copper would need smelting too, and that might have been done in a 3rd location. Anyway, just professional passion speaking. Bisous, belle Americaine, …! I love the compact too! It reminds me of the interiors of all the old school buildings in NYC, the Empire State, the Chysler and [my favorite] the Channing Building. 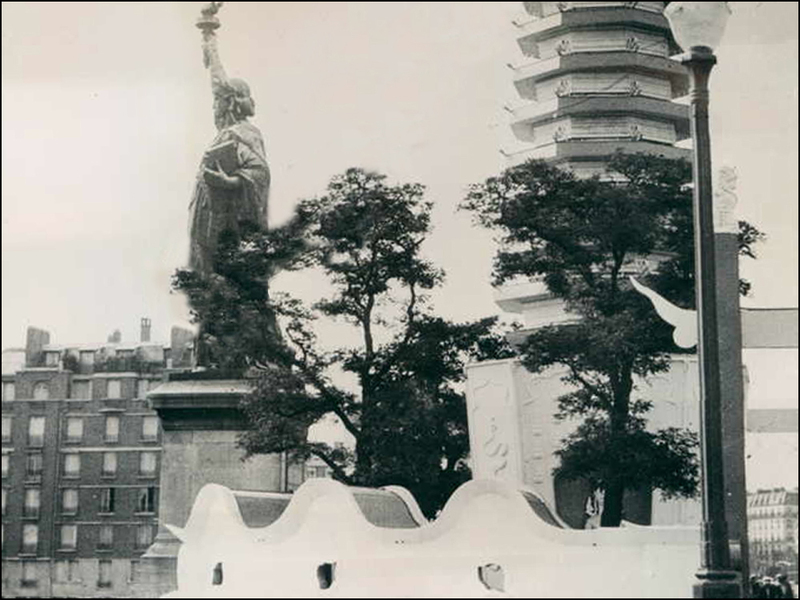 What’s that pagoda-type building behind the Statue de Liberté in the sepia-toned picture? Fabulous choice for an Election-themed piece. Gave me nostalgia about the time we went to the top as kids. I expected the crown to be more grandiose when you finally got there, Mom almost needed a bag to breathe into when the stairs spiraled tightly through the neck and my younger brothers kept trying to pry the dried chewing gum off the exterior walls. I think that’s the last time we took out-of-town relatives to a tourist attraction. Well, thank you, Lady!! As a former Staten Islander, I also love the old-school buildings in New York City. The Empire State Building is my favorite. I’ve watched Leo McCarey’s “An Affair to Remember” (1957) with Cary Grant and Deborah Kerr too many times to count! I always liked that line, “I lift my lamp beside the golden door . . . .” When I was a kid of 12 (in 1964) we entered New York harbor on the USS United States, and I stood on deck holding my parents’ hands among a group of people who were seeing it for the first time (they, not me), and it was very moving to see how excited they were. I’m moved again now, thinking back about it. Thanks for bringing back this memory. Another great post, T! And I have to say I love your sign-off photos – they’re sad and funny and very beautiful. Thank you, Richard! I also love the photographs of Jeanne and Emanuel Herring. The top shot of Jeanne and the Captain is adorable. She looks radiant! 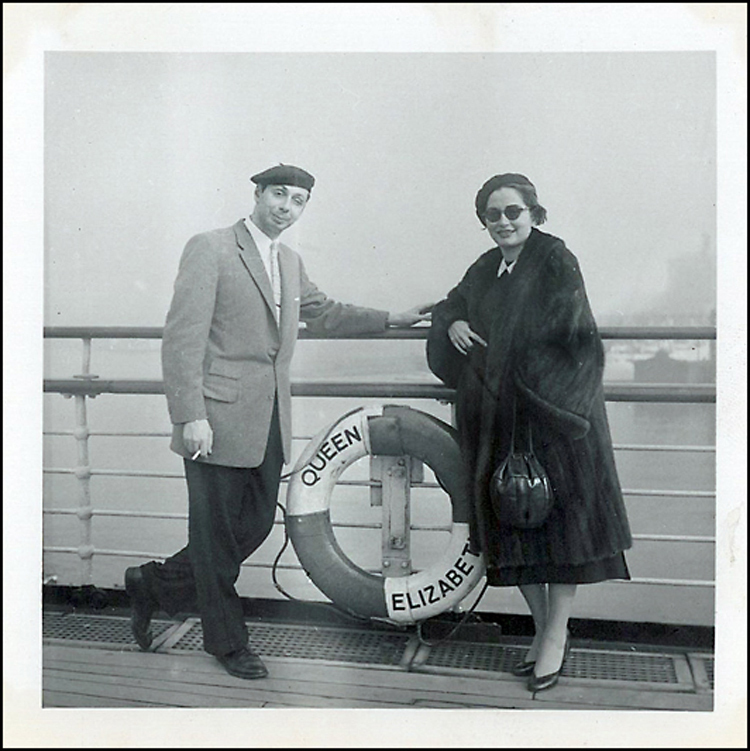 Jeanne and her husband Emanuel traveled through Europe during the fall of 1956. Their trip souvenir book is such a treasure. I plan to share more pics! T.
Oh, yes, Deano! The Statue of Liberty is also one of my favorite landmarks. I haven’t met her cousin in Portland. I’ve seen pics. She looks fabulous! I love the eagle. Nice touch! Have you taken photographs of her? T.
Awesome post! You hit all of them, from the Luxembourg Gardens to the Pont d’Alma. Can’t sneak anything by you, Theadora! Thanks for the lovely photos and the marvelous tribute. A great tribute to “la belle dame”! I enjoyed this piece. 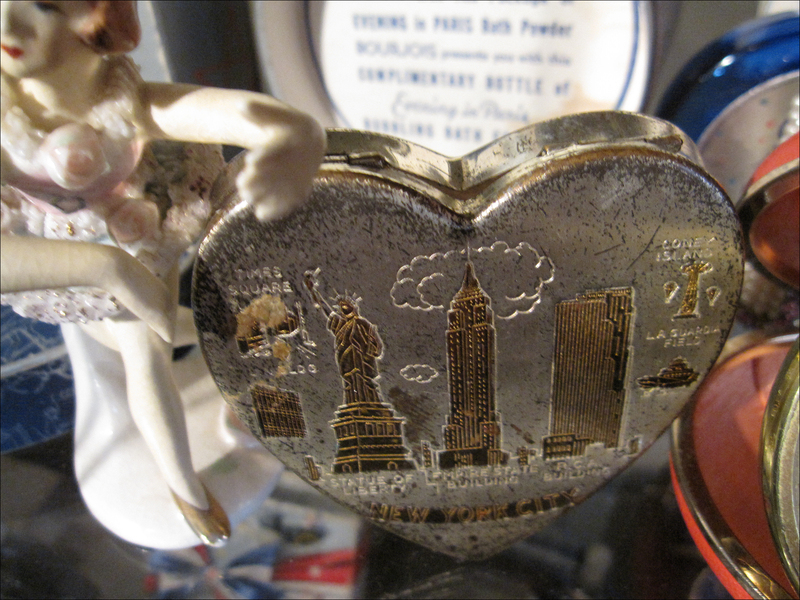 My memories of the statue of liberty come from my visit in the mid 1940s. While much of the visit is vague my recall of the inside of the statue is vivid. As a 5-year old I was facinated by the metal stairs and they were so narrow are went up what seeme like forever. We were able to get to the crown and I was held up to see NYC. Also, I recall looking up at a very very narrow stairase going up to the torch – not sure if people went up. 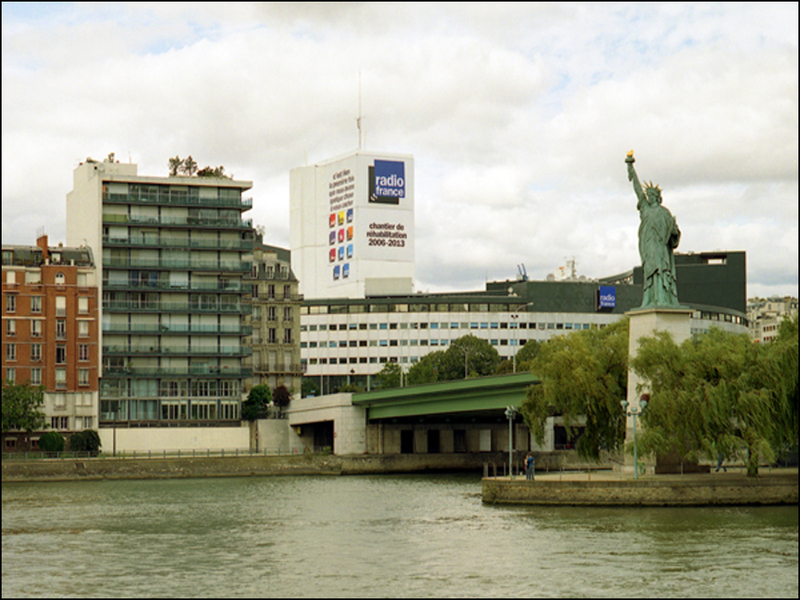 When we were in Paris we did get to see La Statue de la Liberté, Île des Cygnes. Thanks for filling in the between years. Thanks for the smile! T.
Could you please let me know where you found the picture of Jeanne Herring with my grandfather captain hogervorst of the holland America line? Also, so you have any more of him? Apologies for the delay! I’ve been on a work trip. Thanks for your message regarding your grandfather, Captain H. Hogervorst. It’s a fantastic photograph, isn’t it? I found it in a family trip scrap book. 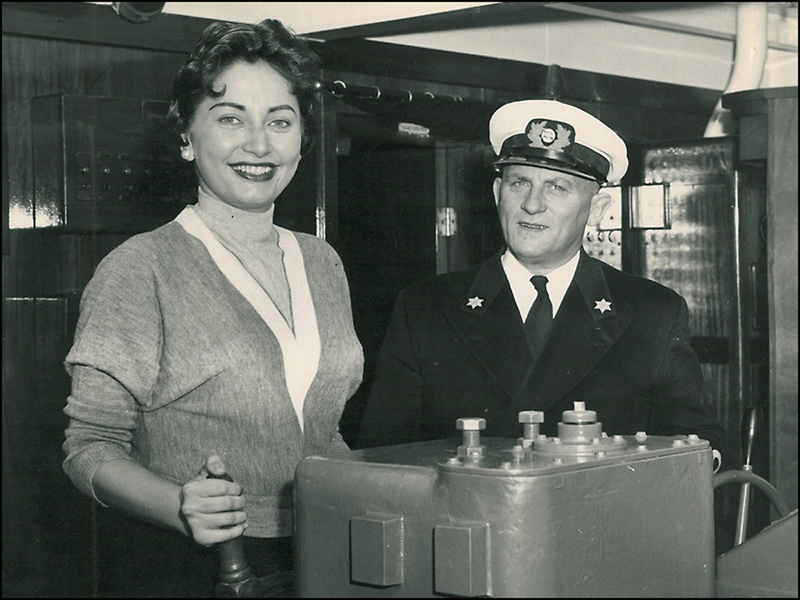 On October 25, 1956, Jeanne and Emmanuel sailed from New Jersey to Southampton, aboard the Maasdam (Holland America). The pair then spent two months, exploring London, Rome, and Paris. Do let me know if you would like scans of the image, along with an official invitation from the captain. I’m happy to send them to you! Here’s my email address: peopleplacesandbling@gmail.com .